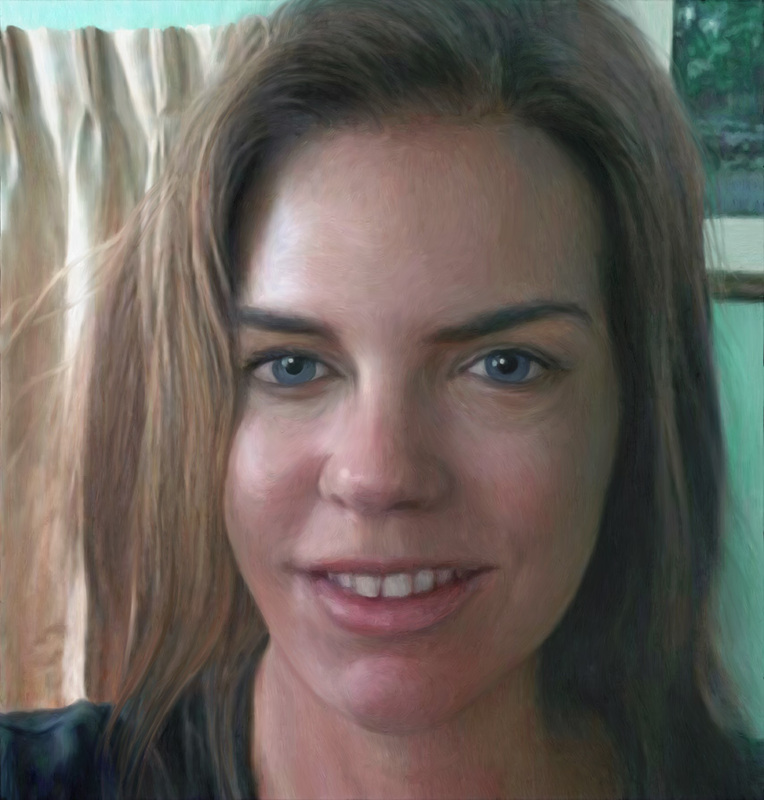 If you just stumbled upon my blog, for this series I’m using the neural network in FaceApp to change my face, then I tweak the image in PS, then paint over it in Corel Painter. It’s more complex than that in terms of content and process, but you get the idea. I’m sharing them in pairs in order to provide the minimal amount for comparing and contrasting. The prior pair were both significantly older than me, so I decided to mix it up and go young. Particularly, all the males so far have been older. This guy is just me with a goatee. That’s about as close as I’m going to get to using the unadulterated me. Part of my idea for the series is that I’m never in it. Well, once in a while I might put in one that’s not very mutated, just so I can have a male version close to my own age. SFAU #7, by Eric Wayne. Digital painting, 24×26″ at 300 dpi, March 2018. As I was typing the caption above, it struck me as odd to include the date. That’s because the portrait photo wasn’t taken then, and besides, age is very relative in this series. I mean, look at the girl. She’s not 52. Original pic, plus goatee, and final image. For some reason I look much taller than I am in the photo on the left. Photos distort even without an App. I brought down the roof and moved over the sign to play off the black of my shirt. The beams in the roof echo the folds in the shirt. This happens in the Photoshop stage. Sometimes I’ll change a lot, and other times not much. I’m getting more ideas as I make more of these. 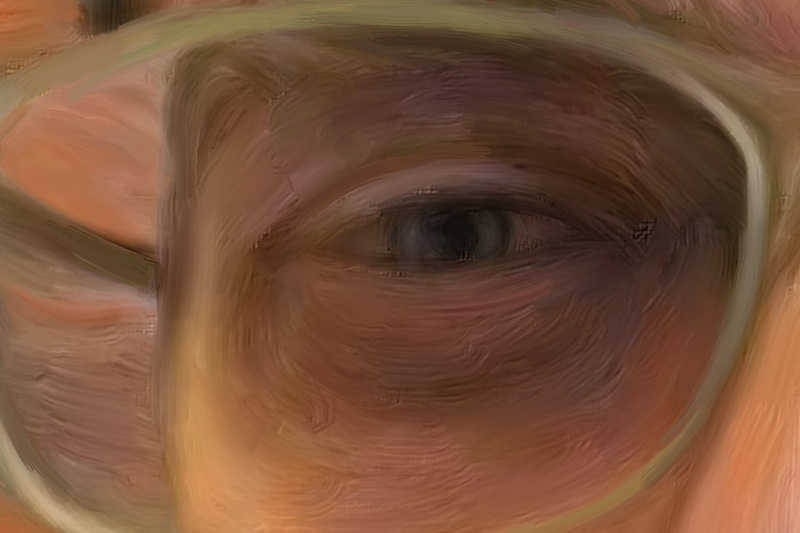 It looks photo-realistic, but up close it’s more of a digital painting. Oh, yes, I was making a mock supercilious expression courtesy of watching Spock, Kirk, and Bones look at each other that way in Star Trek when I was a boy. Clearly, intelligent people can raise on eyebrow. For me it’s my left. You’ll notice in a lot of the pictures that seems to come through. My left eye is my good eye, or rather the one I favor, because right now my vision in my right eye is better. Note that I frequently make silly faces in photos because I’m self-conscious about being snapped, and, uh, that’s part of why I’m doing this series. 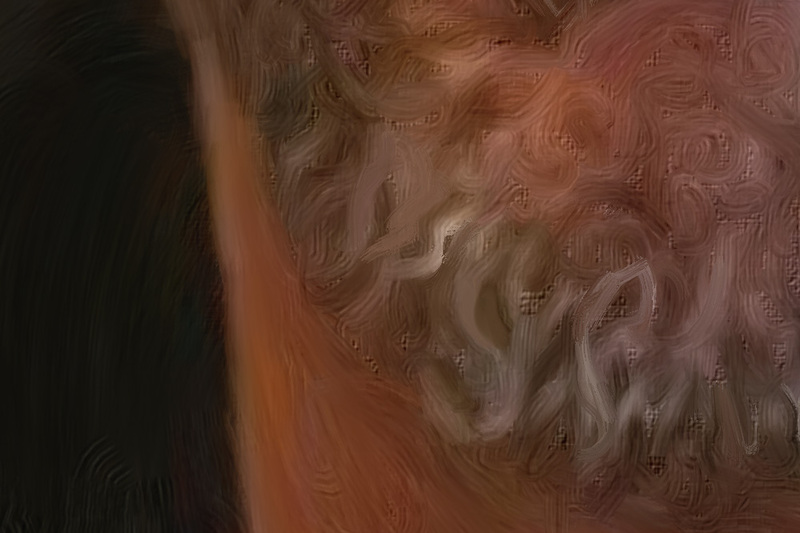 If you’re wondering why I bother to make a digital painting, one reason is that the app makes tiny images that are not worthy of printing, and the other is that it gives me more control, makes it more mine, and adds another artistic dimension. The final versions are very large and can be printed about 2 feet wide, though you could go twice that big. And then at that scale you see the painterly details. SFAU #8, by Eric Wayne. Digital painting, 22×24″ at 300 dpi, March 2018. I chose this one next (there are more than a dozen solid contenders) because 1) I’m alternating male and female, and 2) I didn’t need to do a lot of Photoshop work on this one, and painting all the bricks in the #7 was a P in the A. Most photos don’t translate into usable images via the App. So, there’s a lot of playing around and experimenting with different photos and different filters. Here I got kinda’ lucky, I think. 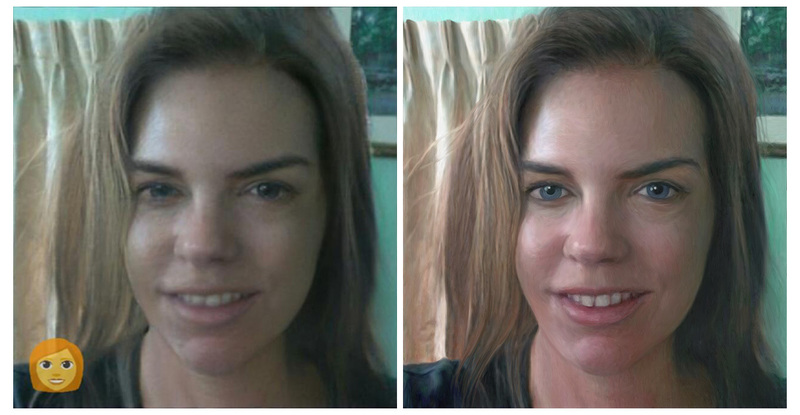 The app did most the work here in terms of changing my face. Here’s what the app did, and then the final image. I made her eyes blue b/c I have blue eyes. Other than that I just had to do the paint over. But that can also be very tricky, especially when it comes to the hair (which I’m improving on). I have a page of notes on the different brushes and blenders I use, and then I work in layers for various reasons. Of course I make each stroke individually, and enjoy the process of learning while doing. You can learn a lot from copying an image. Also, of course, I’m not really great at those sorts of details. I also see some mistakes as I get better at doing this (this is NOT one of my more usual styles), but I can go back and fix them later if I want, ’cause it’s digital. Above you can see how I change the direction of the strokes to go with the face (ex., the teeth have downward strokes and the lip has crossway ones). You might also notice that I don’t add hyper-real details. 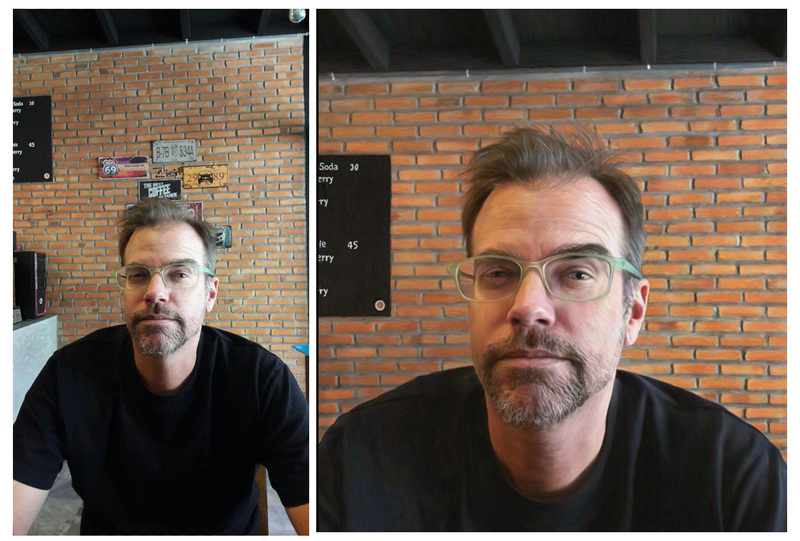 The pic FaceApp produces is pixellated to all hell, by I turn this to an advantage by NOT obsessing over little details when the general impression is photo-realistic anyway. As is, these take me about 2 days each. I wouldn’t want them to take a week. 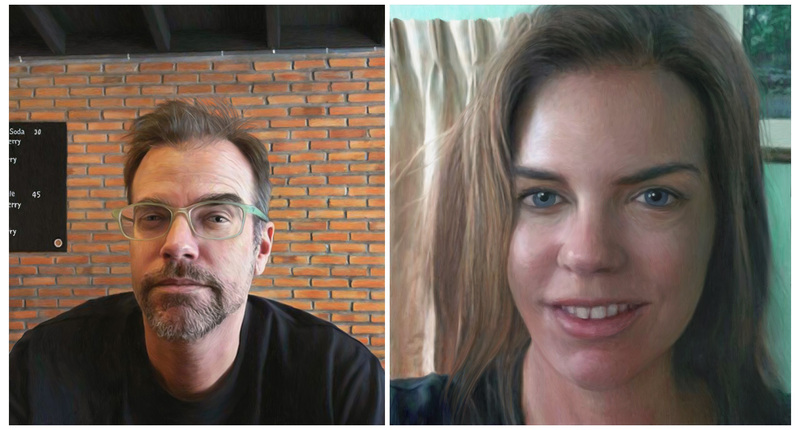 Part of the content is the uncanny, and uncomfortable sort of effect the app sometimes produces. The next 2 will be different. I’ve already chosen them. You’re in for a surprise or two. Here’s all eight so far. Don’t forget that you can help make my art and criticism possible (see below). If you like this series, or my other ongoing series, or my art criticism, please consider helping me be able to continue to work. Through Patreon, you can give $1 (or more) per month to help keep me going (y’know, so I don’t have to put art back on the back-burner while I slog away at a full-time job). Ah, if only I could amass a few hundred dollars per month this way, I could focus entirely on my art and writing. See how it works here. 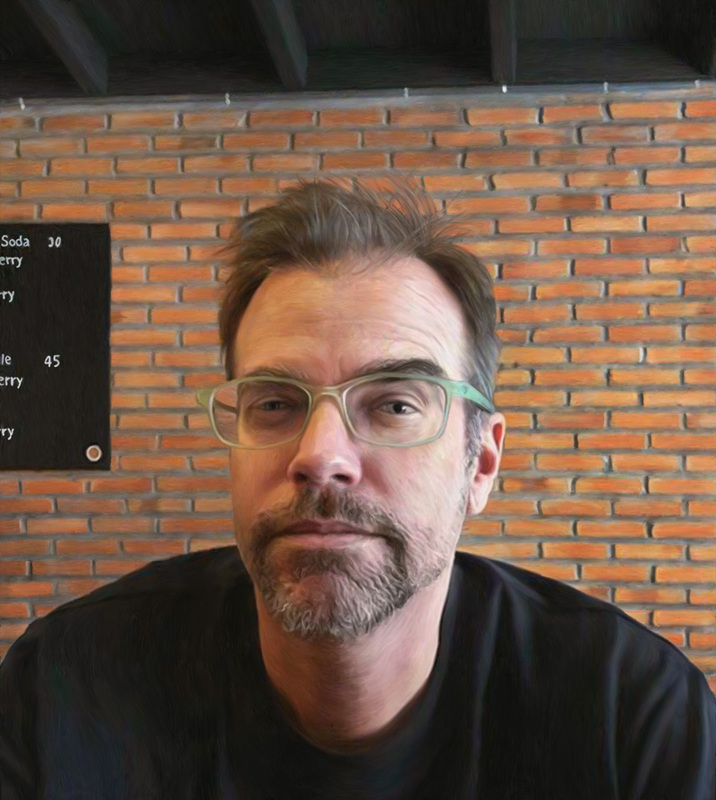 Posted in art, Selfies From Alternate UniversesTagged art, contemporary art, digital art, digital painting, painting, photography, portrait, self portrait, selfieBookmark the permalink. These are great, your best looking ones so far. 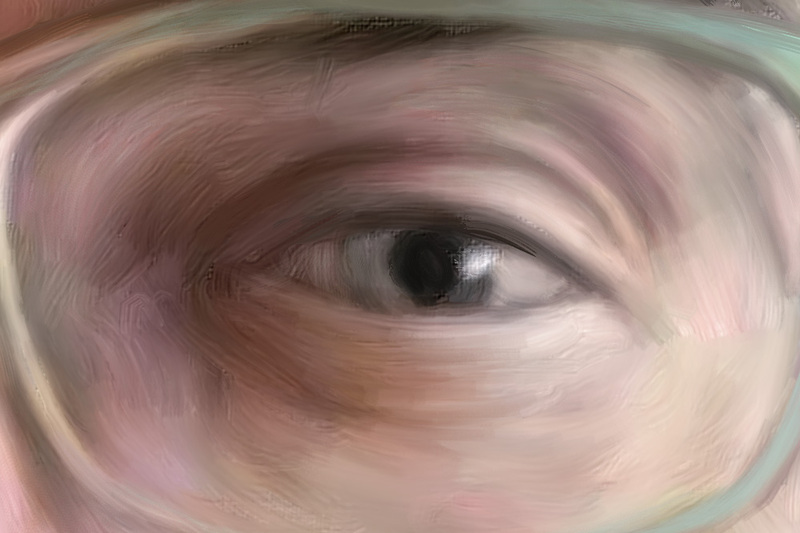 And they look so realistic too, it’s hard to wrap my mind around the fact that they’re digital paintings. I also like how you edited the background for the man, it makes all the difference. Now I’m left wondering what surprises are in store for next time. Gotta try and mix it up. Not ALL the men can be old and/or ugly… There are filters to make people more attractive, but I don’t use those, or haven’t so far. Maybe I’ll throw in a “Hollywood” version at some point. I’m more likely to combine it with something else. I tend to favor the oddballs.